Shri Guru Ram Rai Public School, Raja Road, D.Dun is a part of Shri Guru Ram Rai Education Mission Dehradun. This Mission has over 128 schools in all over India.Brahmaleen SHRI MAHANT INDRESH CHARAN DASS with his cherished vision of providing English medium education to the needy village children and make all possible facilities available to them started this chain. 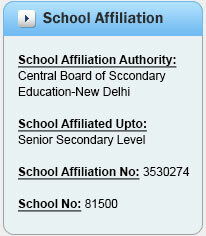 Shri Guru Ram Rai Public School, Raja Road, D.Dun is about 1Km.from the Clock Tower which is the heart of the city. The area around the school is mostly inhabitated by the middle class families. Therefore the resident of Paltan Bazar, Dhamawala, Lunia Mohalla, Raja Road met Shri (late) Mahant Indresh Charan Dasji and requested him to start an English Medium School at Raja Road. So that their children could receive good modern education without facing any difficulties of transport and exorbitant fees. The School will try to work upon the following points and will definitely bring about the change in the coming yearS. To impart quality education especially to all the sections of society. To develop important traits of character like honesty, diligence, self discipline, sense of responsibility, concern for human rights and to promote latent talents for leadership and responsibility.